March 28, 1990 – U. S. District Court Judge William Hart issues an order to sell the 85-year-old S. S. Clipper, the former Milwaukee Clipper, at auction on May 2 with only minimum bids of $100,000 accepted. Alan Amos, the custodian for the 361-foot-long former Great Lakes pleasure cruiser, says that he has received about 30 inquiries about the ship. He says, “As far as I can recall, none of them came from scrap yards.” Although there are more than $500,000 in claims filed against the owner of the ship, the vessel will be sold free from those claims, according to Judge Hart. The Clipper was built in 1904 as the Juanita by the Anchor Line of the Erie and Western Transportation Company. According to the National Park Service, “For savvy and well-heeled travelers, the steamer Juanita offered the epitome of first-class Great Lakes coastal maritime travel between Buffalo, New York, and Duluth, Minnesota.” [www.nps.gov] The Juanita was rebuilt in 1940 and renamed the Milwaukee Clipper. The ship had facilities to load and store 120 cars as well as a dance hall, bar, movie theater, casino, soda fountain, children’s nursery, and cafeteria. She began service between Milwaukee, Wisconsin and Muskegon, Michigan on June 3, 1941, a service that ended in 1970. 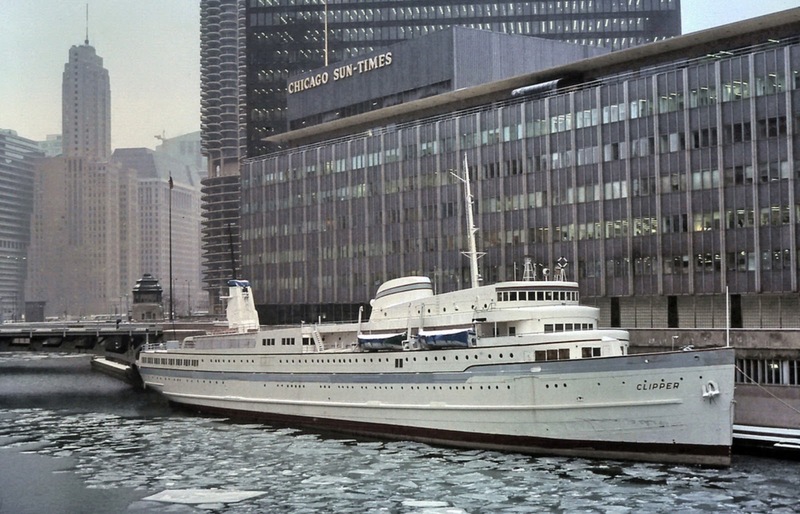 The ship was moored in Muskegon from 1970 to 1977 at which point she was renamed the S. S. Clipper and moved to Chicago’s Navy Pier to serve as a restaurant and floating museum. In 1983 the ship was named to the National Register of Historic Places and in 1989 she was designated a National Historic Landmark. In 1990 the S. S. Clipper was moved to Hammond, Indiana as the centerpiece for a new marina, and seven years later an organization purchased the boat and moved it once again to Muskegon, where Milwaukee Clipper Preservation, Inc. set about the enormous task of raising funds to restore the vessel. Today the ship is a floating museum, moored at a pier in Muskegon at the corner of Lakeshore Drive and McCracken Street. March 28, 1930 – The United States Postmaster General, Walter Brown, refuses to approve plans submitted by Chicago architect Ernest R. Graham for a new $14,000,000 post office, sending the plans back to the firm of Graham, Anderson, Probst and White for revision. Brown says, “This is the first time I have given the matter my personal attention. Up until 10 days or two weeks ago the whole proposition was handled by subordinates. Then the exterior plans arrived. I took one look at them and decided they were no good. Mr. Graham has submitted plans for an unsightly … building.” [Chicago Daily Tribune, March 29, 1930] In Chicago an exasperated Graham says, “I have submitted not one but three different sets of plans. One of those was for a flat roofed building on which airplanes could land … I do not consider any of the plans are of an unsightly building, but efficient in handling the vast amount of mail in the largest post office in the world was a large consideration.” Representatives of Chicago builders and labor unions meet as soon as the news reaches the city. As the Depression grinds the workers of the city into poverty, there is desperation in trying to get such a massive project off the ground. A telegram is sent to Washington, D.C. tersely stating, “Unemployment conditions in Chicago very serious. Possibly more than 60 per cent of building trades have been out of work prior to Jan. 1. 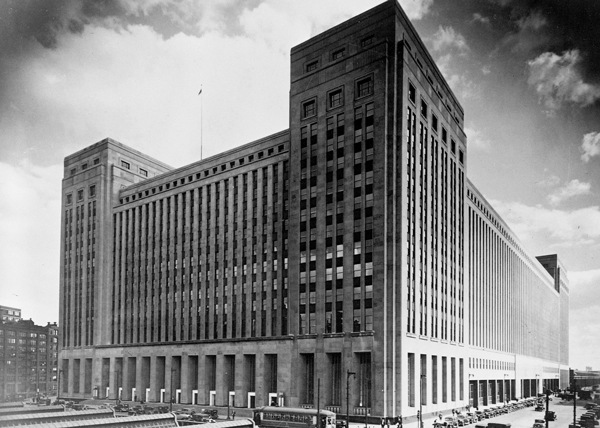 Urgently request that you make every effort with postoffice department to hasten plans at once in order for construction work on new postoffice building in Chicago to be started as soon as possible.” The pressure had its intended effect; the above photo shows the completed post office building in 1932. March 28, 1974 – Appearing before a United States Senate sub-committee on water resources, Mayor Richard J. Daley once again talks about swimming with the fishes. The committee is reviewing plans for the proposed Deep Tunnel project and its 120 miles of waste water tunnels designed to eliminate flooding and clean up the city’s waterways. 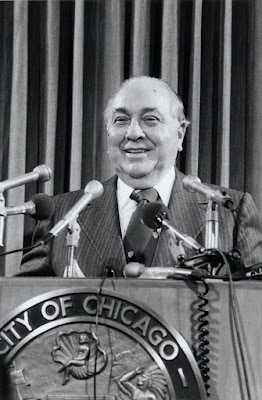 Speaking to the committee chairman, Senator Mike Gravel, the mayor says, “Senator Mike, we hope to clean up the Chicago River so you can fish in the river at noontime. And with the help of the President of the Forest Preserve District, we hope to have a forest preserve, too, and you can barbecue your fish.” [Chicago Tribune, March 19, 1974] When Gravel asks Daley to place a value on the benefits that would come from such an expensive project, the mayor responds, “How do you put a value on young people in the inner city being able to fish in the river, which they never had before? Would you say $500, or $1,000? It is very difficult to put a value on that.” The hearing is held at the headquarters of the Metropolitan Sanitary District as a first step in obtaining federal funds to help carry out the huge project. March 28, 1943 -- Chicago officially becomes a city with a subway when at 3:18 p.m. a three-car train leaves the elevated tracks south of Arrmitage Avenue and enters the Clybourn-Diviision-State Street tube, today's Red Line. The train carries newspaper reporters and about 150 employees of the subway department. Operating the train is Charles Blade of 1127 Newport Avenue, an elevated lines motorman for 29 years. Since Blade has never seen the inside of a subway, an electrical engineer, C. J. Beck, stands at his shoulder. 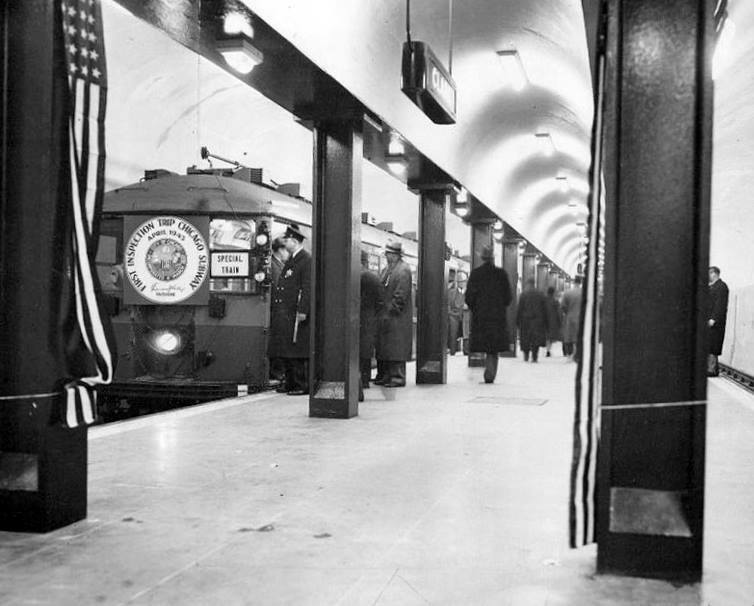 Although Chicago's first subway will not officially open for another six months, this trip and another one on April 2, 1943, shown in the photo above, are made just in time for the re-election campaign of Mayor Ed. Kelly. According to the Chicago Daily Tribune, "Women standing in their backyards waved as the train dipped into the ground. Kids lined the railings. A passenger shouted for a bottle of champagne to christen the subway but only a cask of drinking water had been brought along."